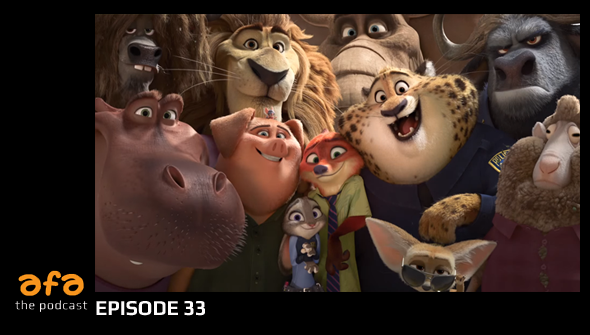 As Zootopia finally arrives in the UK (under the title of Zootropolis) it's time for Chris, Rachael and Dan to sit down and talk about Disney's latest smash hit. Before that we talk about some of the latest animation news, including the Annecy line-up, Amazon's moves into anime streaming and the new film coming from Anomalisa makers Starburns. Unfortunately we had a ton of issues with Skype this week, so the audio quality is not as good as it should be, and we lost the final part of the recording entirely. There's still plenty of stuff to get stuck into though. Warning: Zootopia spoilers start at around 55 minutes. Listen to the episode here, or find us on iTunes, Podcasts.com and Stitcher. If you like the show, don't forget to subscribe via the method of your choice, and why not leave us a review? They can really help others discover the show! Directly download the podcast here. Find all our previous episodes here. Want to send us a message, question or suggestion for a future show? Email us at podcast[@]animationforadults.com . If you'd like to advertise or sponsor a future episode then please drop us a line right here.